Last year, we celebrated the 1st ever official Kickball Day on April 17th. Kickball enthusiasts all over the country hosted kickball games, contests, parties, and bar crawls to share their love of the game. Since many of you play kickball at different times of the week, we want to invite you to join the celebration of Kickball Day 2015 on Friday, April 17th and throughout the season with the #MyKickballDay Challenge! Follow WAKA on Facebook, Instagram, and Twitter and share your kickball adventures this season with #mykickballday! We can't wait to see what you come up with! Commit to trying a #MyKickballDay challenge. 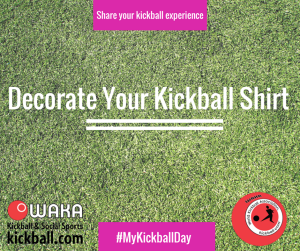 Share how you're celebrating on social media using #MyKickballDay. Invite a friend to your next kickball game or a Kickball Day party with your league.